Screen sharing with WebRTC technology, requires no installations or plugins. View and interact with the web browser of your visitor at a single click. Voice and video calls helps in making customer conversations meaningful during the chat sessions. Connect with your web or apps visitors in real time and engage them by triggering right messages. 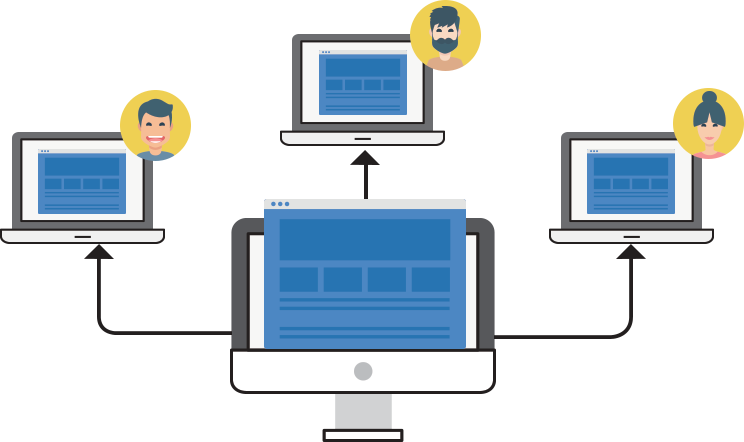 Connect your website visitors to the right departments for better performance. In order to reduce the handling time manage departments and distribute chats to various teams. Easily add video and voice to your iOS and Android apps by using REVE Chat’s mobile SDK. Provide your customers a better customer experience with instant in-app service. Start chat and messaging by integrating REVE Chat API. Engage your customers better and deliver a better customer experience. Confidentiality of business information shared by customers is crucial. REVE Chat screen sharing tool conveys your information in a secured manner with 256-bit encryption. Level up your your branding by customizing your live chat window. Enhance your user engagement level with personalized greetings and right messages based on customer journey. Assist and engage customers across various channels under single platform by offering effective support by the visual tools like co-browsing, screen sharing, video chat and live chat. Screen sharing is a boon for support agents as this helps them to interact with the customers in real time. Customers queries are identified properly and resolved quickly that increases customer retention. You can see your customer browser screen with a single click. Guide your customers and make them understand things better and improve the quality of customer service. Once you guide them on their screen and show them how to do it, they tend to trust you more. 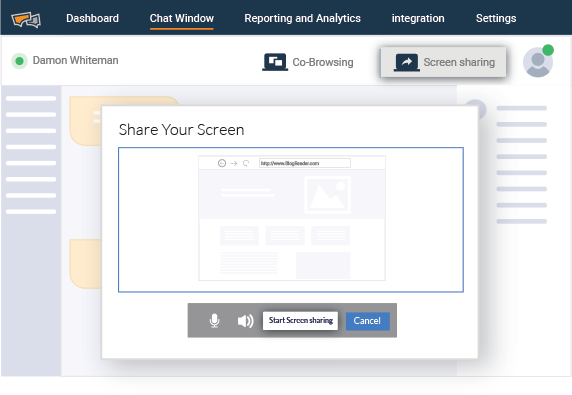 Screen sharing helps your visitors to share their screen instantly for sales demos and collaboration. 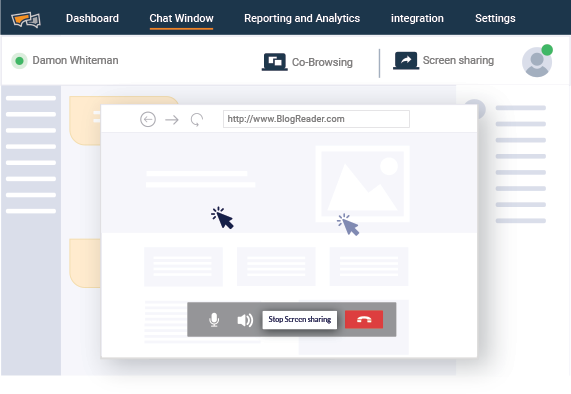 Seamlessly, go to customer’s screen from live chat without any installations and guide efficiently. With a single click sharing the screen saves time and give better buying experience. Connect with your customers in real time to provide quick resolution. Seamlessly engage with customers by reducing handling time and make real time communication easy. Allow chat access to the specific domains trusted by you. ReManage only the domains that are certified and authorized for chat. Access will be disabled to anyone outside the certified domain list. strict access from the domains which are not authorized to stop anyone from misconducts. Save additional details of your website visitors and customers that can be used if needed in the future. With advanced routing the incoming chat requests are routed to the right agent. Routing can be automatic, based on URL or robin-rule to deliver an efficient live chat performance. Prepare and use pre-set responses for the commonly asked queries by customers. It reduces handling time and makes the customer conversation effective. Guide your website visitors and customers personally through the complex process by understanding the problem over first-hand. Assist your customers for both sales and technical support. Interacts and assists the customers in real time reduces handling time and makes team productive. Using the visual engaging tools during the chat sessions makes the conversations meaningful and raises the chances of sales. Agent can use the power of screen sharing and actually demonstrate to customers about product details. It gives you a new approach to answer your potential customers in a more engaging manner. During the training session, go directly hands-on with the product and your team members. Screen sharing gives a direct communication medium where team members can easily work on complex issues in virtual environment. 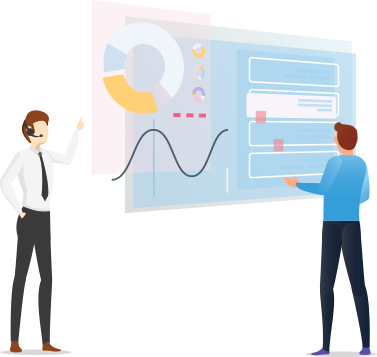 Screen sharing helps to describe the features and benefits of your products & services to your customers to provide clarity and close sales successfully. Develop a sense of trust and connection with customers. Sharing screen with technical experts in real time allows them to the problem in first-hand. The customer can be guided to a solution and resume work as soon as possible. and experience to the customers.